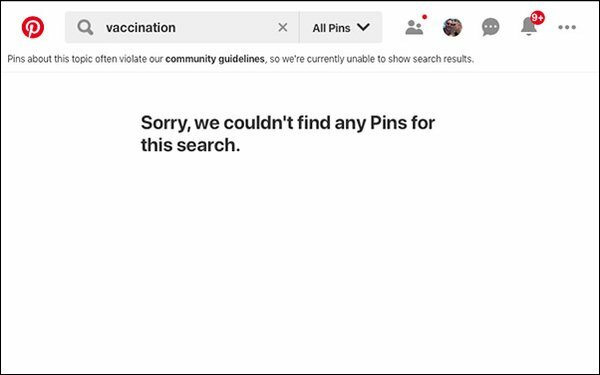 In a move that might be considered censorship, Pinterest has stopped showing results on the topic of vaccinations as it tries to control what it considers "unsubstantiated" health claims. The social site, which has been acting more like a search engine of late, toldThe Wall Street Journal that it took this "temporary but necessary measure until it can develop better strategies to sift through" what it describes as "'polluted'" content. Last year it also made a similar decision to block searches for "dubious cancer therapies." On the site, users can still pin vaccine-related images to their online boards that might lead to suggestions for similar content, but the posts no longer show up in searches. Facebook also recently jumped down a similar rabbit hole when it announced it would consider removing or pushing down in recommendations and search results any anti-vaccination content from queries, including Groups You Should Join. Pinterest and Facebook, along with Google, Bing and others, are grappling with the issue of when to take responsibility for misinformation, so much so that the tech companies need to remove content. The action might remind some of the death of Wei Zexi, a college sophomore, after he followed bad cancer treatment advice in advertising that served up in its query results. Chinese government officials charged the search engine Baidu for running misinformed paid-search ads. Baidu had to change the way it displayed search results to more clearly label the ads. They also lack objectivity and heavily favor advertisers. In addition to changing its algorithm, Baidu set aside 1 billion yuan, or $153 million, to compensate victims of fraudulent marketing information.